Internet users today are considered fortunate because webmail providers like Gmail have improved their security features to further protect the account from unauthorized access or recovery. Many years ago, an email account password could be easily reset by answering the secret question where the answer itself was sometimes publicly revealed in the user’s social networking webpage. Thankfully, Gmail has stopped supporting security questions for account recovery and only allow recovery through phone or an email address which is far more secure. Another effective layer of protection can be applied to your webmail account to prevent unauthorized access is the 2-Step verification. By enabling this feature, the hacker won’t be able to login to your webmail even if they’ve somehow managed to steal your password because they don’t have access to the physical security key such as YubiKey to plug in to a USB port, or your phone to obtain a unique code. While these 2 preventive measures are good enough to keep your web email account safe from being illegally accessed, it is good to periodically check your email account login history for unknown login sessions. Here is how to check your last access login details for 8 different free web email accounts. After logging in to your Gmail account, the bottom right of your web browser will display your last account activity. Clicking the Details link will popup a small window showing your last 10 accesses with details such as access type, location, IP address, date and time. It also tells you if your account is currently open in any other location, giving you the option to sign out of all other web sessions. Microsoft allows you to view your last 30 days login history from the recent activity page. Unfortunately, this recent activity page is not directly linked to your Outlook Mail and requires a few clicks to get there. Once logged in to Outlook Mail, click on your profile icon located at the top right, then select “View account“. 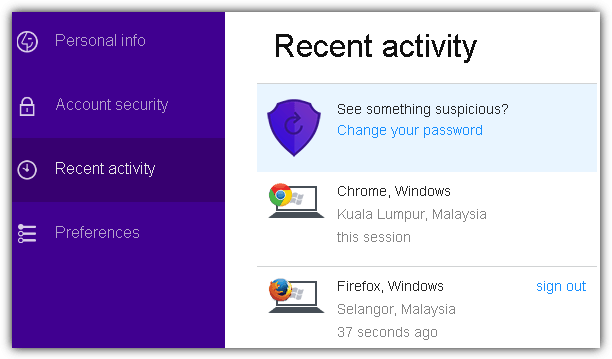 Click at “Security & privacy” from the menubar and finally click at “See my recent activity“. An additional verification step is required to go through by providing a security code received on your phone or alternate email address registered at Outlook. On the recent activity page, you can see a list of login sessions with time and approximate location. Clicking on an activity will show more details such as the device/platform, browser/app, and IP address. Alternatively, you can just visit this direct link to immediately get to your Microsoft account recent activity page. Similarly to Outlook Mail, your Yahoo recent activity page can be found in your Account Info area that displays your previous login sessions based on different devices. After logging in to your Yahoo Mail, move your mouse cursor over to the settings gear icon and click at the Account Info. Alternatively, moving your mouse cursor over to your profile icon which is next to the gear icon will also show a link to your Account Info. When you see your Yahoo Personal Info, click on “Recent activity” from the left hand sidebar. Your Yahoo recent activity page displays previously logged in sessions based on different devices and each device has a 30 days login history. For your convenience, you can access your Yahoo recent activity page from this direct link. ProtonMail is a secure email system that offers end to end encryption and is gaining popularity since opening to the public in March 2016. It also claims to be anonymous because the servers located in Switzerland don’t store any IP logs and don’t require any personal information to register a new account. Weirdly, while they claim that they don’t store IP addresses that can be linked to your anonymous email account, they do store authentication logs showing the login events with the IP addresses. You can view ProtonMail’s authentication logs by going to Settings and click on the Security tab. You can also click on this link to directly get to the Security page of your ProtonMail. 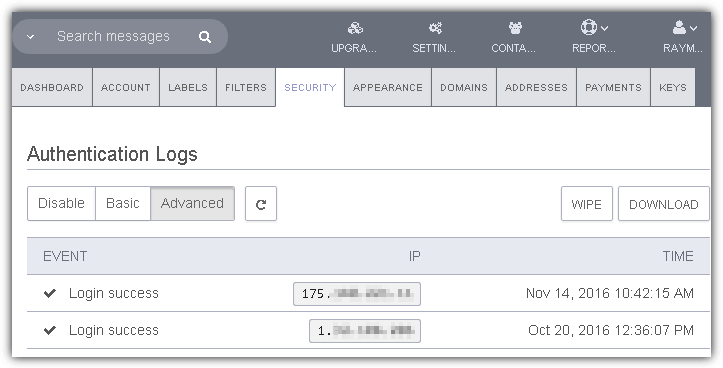 The Basic option only shows the event of whether a login is successful or not, while the Advanced option shows the IP address. If you’re uncomfortable in ProtonMail “tracking” your login IP addresses, simply choose the Disable option instead. Yandex is a popular search engine and they too have their own email service known as Yandex.Mail that offers unlimited storage. Similar to Gmail, you will find date and time of your last login at the bottom of the page. Clicking on it will bring you to your Yandex.Mail log page showing the date, event, time, country and IP address of each changes made to your account. Another way to get to the logs is by clicking the settings icon and selecting Security. 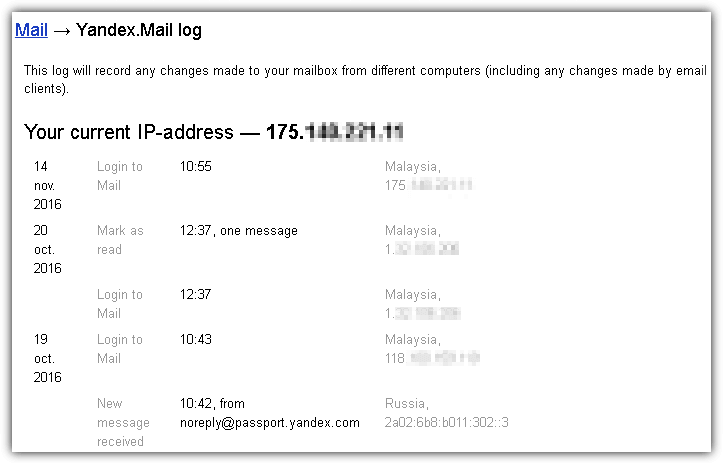 Then click the “View Yandex.Mail log” hyperlink. Unfortunate it is not possible to obtain a direct link to get to the Yandex.Mail log page because the URL requires a unique UID that is assigned to each account. FastMail is now offered as a premium email service only through paid accounts as their free service was discontinued a few years ago. FastMail seems to be a huge believer of two factor authentication because they currently support many different methods such as authenticator app, U2F, OTP, SMS codes and in fact they were one of the first to implement a YubiKey only login feature at a very early stage. 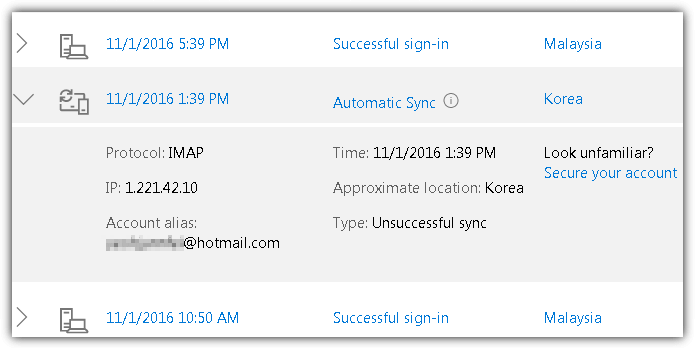 FastMail allows you to view all successful and failed logins in the last 2 weeks but requires a few steps to get into the LoginLog page. After logging in to your FastMail account, press the Shift+G keys simultaneously to bring up the menu and go to “Password & Security”. Scroll to the bottom of the password & security page and click on the link that says “View all logins in the last two weeks”. Normally an email server will include certain traceable information such as the sender’s IP address in the headers to prevent abuse, but Hushmail focuses on privacy and they don’t include IP addresses in the email headers. While you can sign up for a free Hushmail account, it has very limited storage up to 25MB, only allows web access and you must sign in once every 3 weeks or else the account will be automatically closed. After logging in to your Hushmail account, click on “See other recent activity” that is found at the bottom center of the webpage. A popup will appear showing your recent login activity with the time, country and IP address. Mail.Ru is one of the top websites in Russia and it doesn’t come as a surprise that most Russians would own a Mail.Ru email account. Unlike most of the email providers that only show a limited amount of login history, Mail.Ru is very flexible and allows you to choose a date range. To view Mail.Ru mailbox usage activities, first login and then click on your email account address shown at the top right located just beside the sign out button, and select “Password and Security”. Scroll all the way to the bottom of the page to view your Mail.Ru activities. You can visit this hyperlink to directly jump to Mail.Ru’s password and security page. Additional Notes: Tutanota and GMX only show last login history but not a list of previous logins. Surprisingly some of the popular email services such as iCloud, AOL, Zoho and Mail.com do not show latest or recent login activities at all. Thanks to share it. This is really a very important information. Thanks so much Raymond for this vital security info.